Record Deal in a Box: Album Edition from Alfred gives you everything you need to get your record on iTunes and other top online stores in as fast as 24 to 72 hours. Your album will have one year of distribution through TuneCore, a music delivery and distribution service that places your original music (and even cover songs) for sale on iTunes, Amazon MP3, Rhapsody, Napster, and other digital retailers. You keep 100% of your rights and royalties. 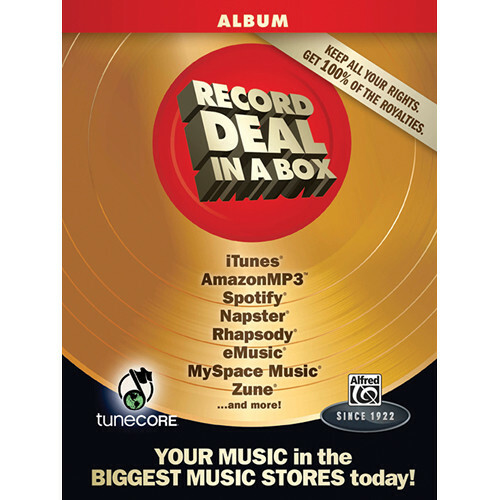 In addition to TuneCore distribution, Record Deal in a Box includes a must-have booklet of recording industry information and critical tips about copyrights, reproductions, derivatives, distribution, and other topics to help you protect your songs and make informed decisions. The booklet also includes practical advice about recording, mixing, and mastering that will improve the sound of your music. You also receive the groundbreaking music recording program Studio One Artist by PreSonus (a $99.00 value!). From tracking and mixing to mastering and distribution, this Mac/Windows program provides a creative and intuitive environment that is optimized for speed and efficiency, yet robust enough for the most complex productions.